Organic sugar acts as the exfoliating agent in this remarkably healing lip scrub. A balanced blend of coconut oil and beeswax give the scrub it’s soft texture and hydrating properties. Coconut oil is naturally anti microbial, protecting lips from cracks, as well as sunburn due to it’s SPF of 15. Beeswax seals in moisture and protects against dehydration. A dash of chocolate extract and cocoa powder not only give it that sweet chocolatey goodness, but also ensure that it is safe to be ingested. It will, however, wipe clean without staining the lips brown. Note: May remove makeup from the lips. Use: Depending on the temperature, you may need to stir the scrub with a small tool until it is soft enough to use. Apply quite liberally to the lips. Rub in small circles across your lips for several seconds until you feel that your lips are free of crust and/or makeup. If you have a particularly stubborn crack or scaley area, allow the scrub to stay on the skin for a minute or few. Then try scrubbing for a few more seconds. Apply more if the sugar has melted (or you “accidentally” licked it off). For really persistent areas, hydrate the area with a healing lip balm and try again later. Results will usually improve over time. This handy balm is designed with the care of minor skin abrasions and blemishes in mind. The essential oils are not only antibacterial and anti-inflammatory but also help fight acne. Coconut oil and raw beeswax nourish and protect the skin while sealing out harmful bacteria. The hydrophobic nature of the wax acts as bandage, making it the ideal salve for scraped knees and knuckles, or anywhere that traditional adhesive bandages are impractical. Note: This treatment is ideal for minor wounds and superficial abrasions only. Deep wounds and bleeding cuts should be treated with traditional first aid methods to avoid serious infections. 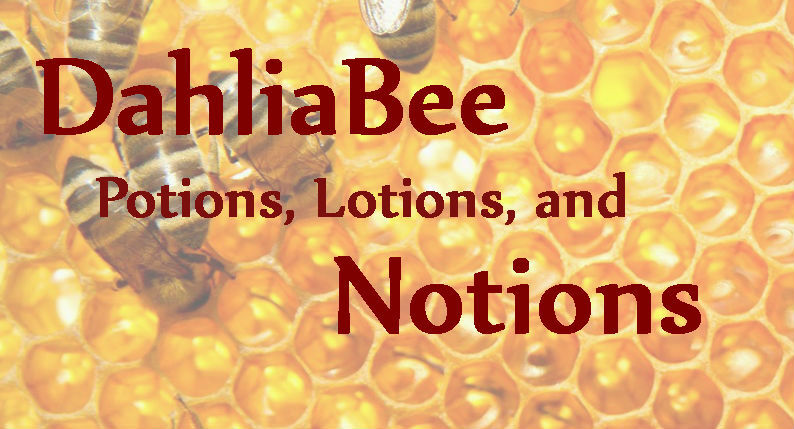 Use for acne: Wash the face with either of Dahlia Bee’s facial cleansers, or a mild, ph balanced soap. Use a clean tool to scrape up some balm, or use a clean fingertip to gather some up, similar to using a lip balm. Apply liberally to blemishes of concern with a swirling motion of the fingertip. Treatment may help reduce a blemish before it erupts. It can also be used to treat and seal a lanced blemish. Use as often as needed until cleared. Use for minor wound care: Clean the wound with a mild soap, warm water, and vigorous rubbing with the fingers. Cleansing should take at least thirty full seconds to a full minute, the idea being to rinse out debris and foreign bodies with little more than water and friction, rather than relying on harsh chemicals to sterilize the wound. Pat the area dry with a clean towel. Gather up some of the balm using a clean tool or clean finger tip. Massage into the wound with a swirling motion. Apply liberally, but avoid excess to the point that it can be easily wiped off by clothing. For slightly deeper wounds (like a nasty cat scratch) it is advisable to pack the wound with the wax after cleaning it. If the wound becomes inflamed, red, and hot to the touch, it may be necessary to switch to more traditional first aid treatments. How it works: I created this balm with the intention of fighting scarring. It is designed to feed, support, and protect the skin while it heals. Scarring can be caused by several factors, the shape of the wound, how much skin is intact, dryness of the wound, premature falling off of the scab, infection, and scratching. The harsh stringent properties of most commercial wound treatments may kill harmful bacteria, but they also strip away the strains that are supposed to be there to help your skin rebuild itself smoothly. The extremely high pH of those products also ‘salt the earth’ so to speak, around and inside the wound so that your body’s natural defenses have a hard time doing their job. This can leave the wound vulnerable to infection, which is why it becomes necessary to use an antibiotic ointment for several days. Now it is important to note that in a deep wound, the benefits of traditional first aid far outweigh the risks of not using them. An infection of a deep wound can actually spread to the rest of your body and cause serious complications, so it is best not to take the risk. But scrapes and shallow scratches, light burns, pinpricks, superficial cuts are generally not at risk for life threatening infections, and often leave scars behind when treated traditionally. This balm is ideal for these types of wounds because it is mild, hydrating, and nourishing for the skin, all which help minimize scarring. Many of the oils are antibacterial, but work within parameters that your body is used to dealing with. The raw beeswax has trace amounts of honey which lends its own nourishment for your skin. Overall the balm hydrates the wound while fighting infection, and giving the skin the tools it needs to heal cleanly. Development: Working in animal care for most of my adult life meant being bitten, scratched, scraped, and gouged. Some really bad weeks would have my hands and arms in tatters, to the point where It was easier to wrap a whole hand than bandage each wound individually. Effective for treating the wounds, but impractical when I tried to keep working. Liquid bandages were more effective for dexterity, but I found that I was susceptible to infections. When my career had me working heavily with aquariums, where even the strongest liquid bandage would dissolve after only an hour or two, I had to come up with a better solution. I had some success using a medicated lip balm for the frequent coral scrapes and barb gouges (fish don’t like having their tanks cleaned one bit!) as the balm kept the tank water away for slightly longer than the liquid bandages. I wanted something waxier that would not pollute the aquariums I was working in, and so this product was eventually conceived and THOROUGHLY tested.